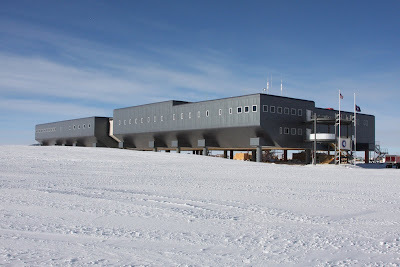 The new Amundsen-Scott South Pole Station has been under construction for almost a decade now, to replace the old geodesic dome which has been slowly swallowed by the snow over the past 30 years. The official opening/commissioning was schedule for the day after I arrived, which meant the station was being overrun with DVs (Distinguished Visitors, like VIPs, but with a different name) flown in from DC for the occasion. The speeches were a little dull and given in the gymnasium, lending the air a of high school assembly, after which flags were raised over the station, subtly telling the world that the US owns Antarctica. One upside to the whole event was that we got a wonderful celebratory meal (duck, beef tenderloin, lobster, etc). We also got goodie bags, including posters, patches, and a commemorative coin. Sweet. To give it that "finished" feel, half of the station was finally covered in siding. The rear is still bare plywood, but it sure looks nice from the front. It was also scrubbed clean inside and out, making life here even nicer. I spent most of the day wandering around checking out the station and environs. 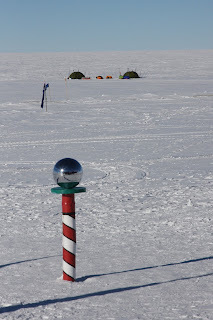 The candy-striped ceremonial South Pole was probably the highlight, but equally interesting were the skiers. People ski either across the continent, or just the last degree of latitude, as some sort of twisted holiday. I say this having ridden a bicycle - for fun - across North America: the skiers are all mad. Later that day, I decided to switch over from "day" (8am-6pm workday) shift to "swing" (2pm-midnight) shift to get better overlaps with the other SPT workers. Shift names here are completely arbitrary, since every day the sun just circles overhead, only rising and setting once per year. My fourth day on station, I switched to a 28-hour day, with 20 hours of work followed by 8 hours of sleep - with the sun always up, things like that are not just possible, but often easier than a standard 24-hour day. My weeks are only 6 days long, but it makes for very productive days, and regular overlaps with everyone else here. What is the coordinates for the station? The geographic south pole is literally right outside the station. That puts us at lat=-90, lon=whicheve-you-prefer. The elevation is about 3000m, and it's almost all ice.